Transgender people face the Herculean task of getting the world to perceive them as the gender they experience themselves to be when all physical characteristics say otherwise. If our culture simply allowed people to discover their gender expression, rather than expecting them to squeeze into one of two bifurcated gender molds, then gender would become just another aspect of personal expression and be allowed its evolution in the individual. But we don’t live in that kind of world, do we? 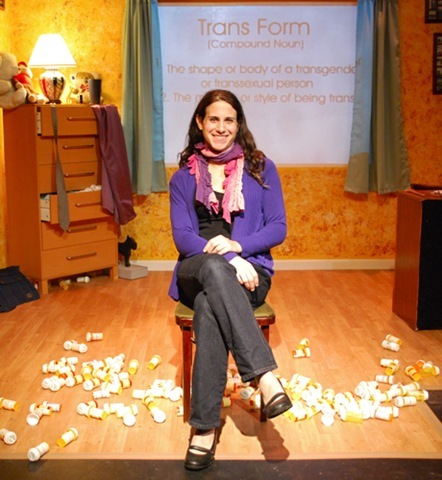 Rebecca Kling’s one-woman show, Trans Form is decidedly, consciously intimate and low-key. It renders in minute detail the everyday ways in which transgender people can feel their personal authenticity subverted or denied. 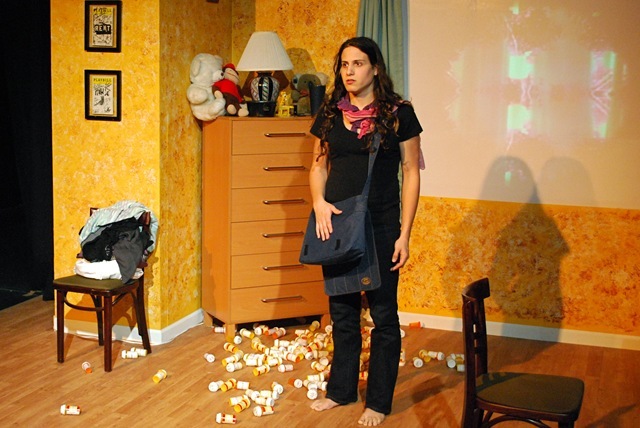 That Kling unsentimentally reflects on how she has denied herself in the past is one of the more intriguing and thoughtful elements of this one-act play, produced by New Suit Theatre and co-directed by Kristin Idaszak and Kate McGroarty. Kling begins with childhood games in which she plays at being a girl but, essentially, her childhood and adolescence is lived as somebody else. Hair pulled back into a bun, in jeans and a dress shirt that covers but can’t conceal her breasts, Kling progresses to femininity as her tale unfolds across twenty years of living in a masculine body. Nothing other than a persistent desire to be a girl, a girl growing into womanhood, sustains her sense of self. But, terrifyingly, it’s a self that can just as easily desire to commit suicide, since what that self wants seems too impossible or too burdensome. Bound in the body of an adolescent boy, Rebecca emerges in Kling’s mind as an urgent, cajoling, even threatening alter ego. So far as support from the outside is concerned, too much of it appears slight and ephemeral against the expectations that gender will eventually match the male body she was born into. Even basic sentences like, “I think I want to be a girl,” can give her parents too much hope, hope that their child will someday emerge “normal,” her gender non-conformity reduced to a harmless phase. Her therapists are either supportive but clueless or really clueless in subjecting her to arbitrary and meaningless tests. Dressing up for Halloween provides scant relief since, for all her efforts, she can’t even pass as female as well as her drag-attired gay college roommate. Love provides Kling the impetus to change and take on the risks and difficulties of transitioning. Love from a woman, who accepts Kling’s identity as a woman, sparks her transformation. Here’s where Kling’s story becomes oddly truncated. In order to appeal to wider audiences and educate beyond the transgender community, Trans Form has to deliver some kind of basic “Transgender 101” talk. But it is the emotional process of transitioning that sustains audience interest. With Rasean Davonte Johnson’s projection design and Sarah Gilmore’s sound design, Kling dons a white doctor’s coat to handle this segment humorously, like the spoof on a black and white 1950’s Social Etiquette film. However, the segment also belies the trickiness of blending personal, lived experience with the medicalized constructions of transgender identity. We hear no further about the affair. It becomes sacrificed to the dry, wry and cerebral delivery of psychological definitions and medical jargon. Likewise, this show still needs further development to sustain even theatricality in the telling of Kling’s story. Some moments are very effective—as when she demonstrates the unremitting requirement of daily hormone therapy. But other sections still require greater physicalization and translation into visual metaphor. Kling has enough emotional distance from her material to observe it with wry and reflective eye. That makes her point of view necessary on a subject that could easily degenerate into maudlin self-absorption. But the artist also needs to lay bare the heart with clarity and precision. An audience may be better informed about transgender experience at the end of Trans Form, but hitting all the emotional bull’s-eyes of transitioning will force them to feel it.